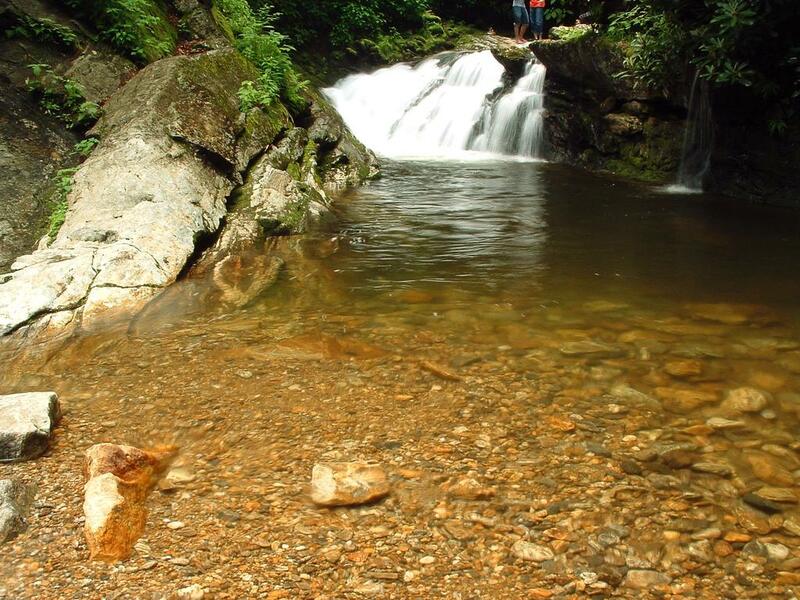 This moderate, short hike takes you to an appealing waterfall and swimming hole on the Yellowstone Prong of the Big East Fork of the Pigeon River. 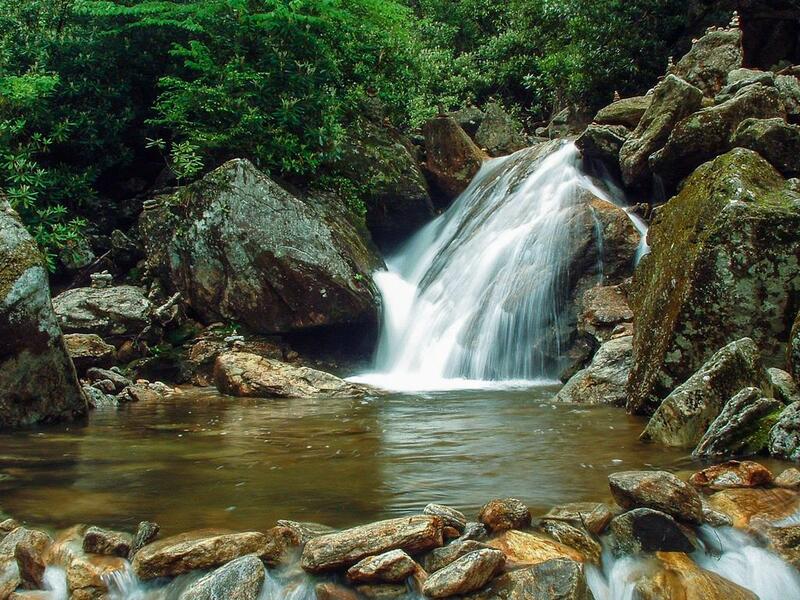 It makes a great summer swimming destination, a great way to stretch your legs if you're traveling the parkway, and a great place for photographers - both for the falls and forest scenes and wildflowers on the way down. If you're feeling hoppy, this would make the start of a more strenuous trek into Graveyard Fields. From Asheville, take the Blue Ridge Parkway south past Mount Pisgah and US 276 to MP 417. Park at the Looking Glass Rock overlook, which is on the left. To begin the hike, cross the parkway and head up the path right beside the Mile Marker 417 post. The path goes slightly uphill, into a cool forest of birches and hemlocks, oaks and maples. You'll come to an open spot and climb a small set of steps, then reach an intersection. The Mountains to Sea Trail comes in from the right and continues straight. Go straight, across an old roadbed. This trail then continues all the way to the falls, and after the steps it's downhill the whole way. The trail is moderate, with a few rough spots - rocks, roots, wet areas, or eroded spots. It's nothing terribly difficult, and most anyone should be able to make the trek. You'll descend into the valley as you go, with the sound of the Yellowstone Prong ever-increasing. 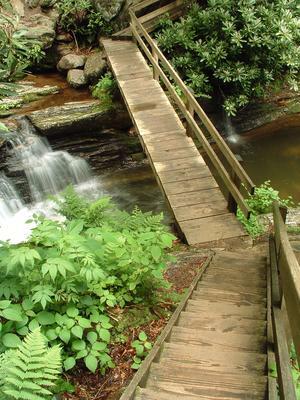 There are a few small log and plank bridges, and some steps at a point just before you reach the falls. The trail descends a steep set of steps which land on a bridge across the Yellowstone Prong. The area is immediately appealing - the lower deep, clear pool is directly below the bridge. 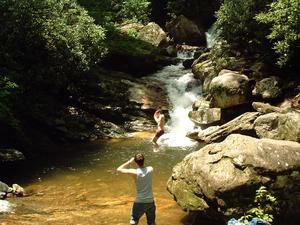 The falls consists of three tiers - and the bottom tier drops directly into the deep pool. There are two more pools between each tier of the falls upstream. The height of the falls is only about 30' total, each tier being between about 10 - 15' high. But the overall scenery and appeal of the deep pools makes up for the lack of an impressive cataract. If you do come during the warmer months, feel free to swim, but despite the name of the falls make sure you bring a bathing suit and a towel/change of clothes - you will get cold! If you don't swim, there are plenty of small beaches and flat rocks to explore or just sit on. If you continue up the trail past the bridge, the trail continues up to Graveyard Fields and eventually ends in the Great Smoky Mountains National Park. To return to your vehicle, backtrack on the same trail. Conntecting Trails: If you continue past Skinny Dip Falls on the Mountains to Sea trail on a steep, uphill climb, you can reach Graveyard Fields. 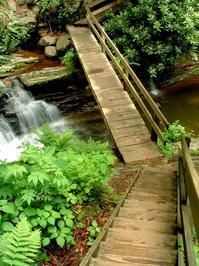 Thus, it's possible to reach the falls from the Graveyard Fields area and vice versa. Cindy said: Perfect description. This hike is short but a little hard and so worth it. 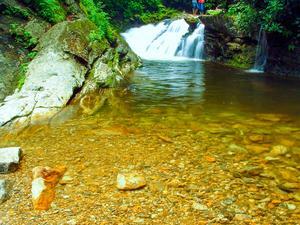 The falls and natural pool areas are stunning. As usual fellow hikers are always polite and share the trail as well. Been twice and will go again! nelly said: Does it cost anything ? Libbie said: Thank you for your informative information regarding the falls, I plan to visit this fall this summer 2013. 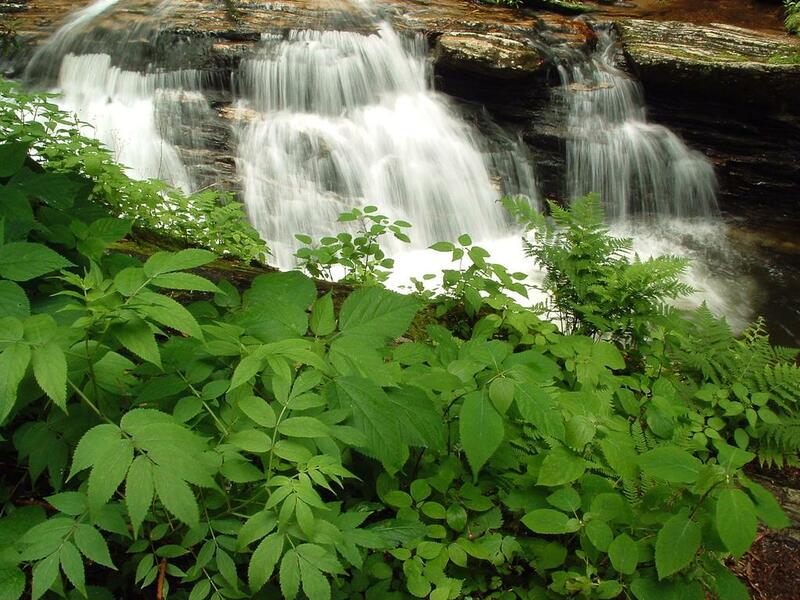 We are from TN and my new hubby is to visit and see as many Falls possible, ive seen several very large falls and several small falls.. The small falls are just as beautiful sometimes the scenery on the hike down is just as beautiful as the fall its self..If you know of any other beautiful Waterfalls pls be so kind to email me back at libbridges69@gmail.com. Thank you and have a blessed day, Libbie "TN Gal Searching for Mother Natures Beauty"!